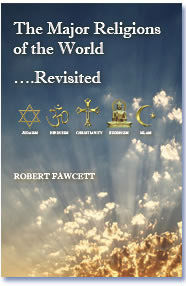 About the book "The Major Religions of the World .... Revisited"
I began writing about religion some 10 years ago. I wanted to learn about the Anglican communion, so I began to write an essay that, in my mind, would be a very short, succinct essay to give a snapshot of this denomination which is worldwide. Of course, this begs the question where did the Anglican Communion have its humble beginnings. It spun off from the Roman Catholic Church in 1534. Then, the question became, where did it come from? It spun out of the split within The Church (meaning, the whole worldwide Christian community) which occurred in the year 1054. This division created the Eastern Church (the Orthodox Catholic Church*), and the Western Church (the Roman Catholic Church). Finally, the question became where did The Church come from? Of course, The Church has its beginnings all the way back to Jesus Christ. Having dinner one evening with another couple, we were discussing a vacation trip where they visited several countries, including Bhutan. Karin (Weber type, wife of Bob) made some observation about one of the sects of Buddhism. It didn't sound correct, whatever it was. However, rather than get off in some deep water that I couldn't get out of (she is a very smart gal), I mentioned that this was one of my "curiosities," and so I would make some notes so we could discuss over dinner another time. Next thing I know, a book, The World's Religions by Houston Smith, showed-up on my doorstep with a note that she "looked forward to having dinner." Hello! That was the beginning of this little project. Although, I did expand this study to include the major religions as this was, for sure, one of my curiosities. Quickly, I discovered that there was not anything on the market that could merely give me a comparison. Even though my book is a synopsis of each religion, and not a complete study, it took a very long time and more hours than I even care to count. Developing the comparison was the challenge. Again, nothing was on the market to help me. Knowing what I know now, I would not even attempted it -- too much time, and too much brain damage. After a couple of drafts that Karin kept sending back with notes such as "you're getting there," this book is the final draft. So, Karin, I'm ready for diner! The rest of the story is that I have a friend who read one of my drafts. In my mind, it was just a long essay. His expertise is marketing, but aware that there was nothing on the market that he could find similar to my essay, he encouraged me to expand several areas, and publish as a book. So, he put me on this path. I t needs to be noted that this was written for me, and no one else, so I could have a conversation with Karin. If anyone else enjoys, well ....that's a plus. * The name most used is the Orthodox Church, and it is also known as the Greek Orthodox Church (at the time, Greek was the world's language, just like today English is the world language). ** The word "catholic" means universal, so the Holy Catholic Church would be the whole Christian Church for the entire world, THE CHURCH. » Is There A Case For The Resurrection Of Jesus?